All residents in the departments of Surgery, Orthopaedic Surgery, Neurosurgery, Head & Neck and Urology rotate through the Department of Surgery, Core Surgery Program for a defined period of time. Selection of residents is made through the National Resident Matching Program. All are matched to specific programs in surgery: seven to categorical General Surgery, three to the General Surgery/Plastic Surgery Combined Categorical Program; one to Vascular; five to Head and Neck Surgery; three to Neurosurgery; six to Orthopaedic Surgery; four to the Preliminary Surgery Program; and four to Urology. The Core Surgery Program at UCLA is a 1 - 2 year program designed to provide progressive graduated experience and responsibility without repetitive service rotations. Although the schedule of rotations has a common core of experience, it is tailored to the needs of each specialty program. Each specialty program attempts to offer, within its core training period, the selection of rotations best suited to provide an educational foundation for that specialty. Therefore, core residents do not necessarily share the same rotations. Direction is provided by the Program Director of the Core Surgery Program with input from the Program Directors in each subspecialty and is administered by the Surgery Education Office. Residents in the Core Surgery Program are encouraged to have close contact with their subspecialty training program director and to participate in conferences and activities in that subspecialty as their time permits. Residents evaluate the curriculum and faculty performance via anonymous on-line evaluation forms completed at the end of each rotation. The director of the residency program reviews a summary of these evaluations. In addition, formal as well as informal individual meetings between residents and their program directors are conducted throughout the year to provide feedback to both the resident and the Surgery Education Committee. The program director also holds regular meetings with the interns and with the chief residents to address problems or issues pertaining to the training program, residents, and teaching staff. Each resident in the program is evaluated monthly by a consensus of attendings and chief residents on the service. This evaluation covers several important areas. Copies of each resident's monthly evaluations are maintained in his/her academic file. The general faculty meet twice yearly to review the progress of residents in the first two clinical years of the program. The resident and program director meet one-on-one following any negative evaluation. Each resident meets at least twice yearly with the program director for individual reviews of clinical performance, research progress, and assessment of in-training exam scores. The resident is given a summary of their evaluations at these meetings which includes comments made by the general faculty during the progress review meetings. Residents also provide feedback about the program anonymously via a web-based Instant Feedback form. Submissions are reviewed frequently by resident representatives and discussed with faculty during monthly program meetings. Residents in the Core Surgery Program take the American Board of Surgery In-Training Examination (ABSITE) each year as a means of evaluating basic knowledge and improving test-taking skills. This examination has been required of all residents in the program since its inception. Prior to that, the residents took the American Board of Medical Specialties examination. The results of the In-Training Examination are used in the overall evaluation of the residents and serve as an important- although not the sole-basis for advancement. It is the policy of the Department of Surgery to provide an average of one weekend day off per week for residents who have in-house call or first call responsibility (i.e., primarily listed on call schedules as the person to be called by nurses and other staff for patients' management decisions). Resident work hours are strictly enforced according to ACGME regulations. Residents may depend upon all members of their team, including the attending physician, to assist them in the management of patients and performance of procedures. All UCLA integrated and affiliated hospitals, where residents are expected to take in-house call, provide clean, quiet sleeping quarters. All sites provide facilities with food available 24 hours a day. UCLA Medical Center and the West Los Angeles VA have designated house staff lounges and 24-hour access to library facilities. The UCLA Medical Center and Santa Monica Hospital inpatient facilities operate using CareConnect, a fully electronic health record. 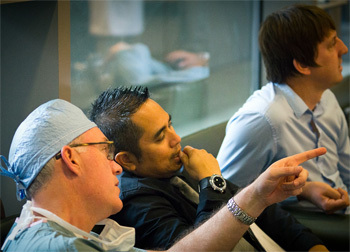 Membership in the UCLA community affords the surgical resident many unique educational and recreational opportunities. The Biomedical Library is probably the facility that residents appreciate most. It receives over 7000 current journals and houses approximately 400,000 volumes. One of the world's finest medical history collections is also found here. The Biomedical Library participates in the National Library of Medicine's MEDLINE network for literature retrieval. Numerous terminals are available for computer-assisted instruction. The Biomedical Library also includes a broad collection of audiovisual software and an audiovisual facility. The Department of Surgery maintains its own library, which is accessible 24 hours a day. Additional smaller libraries are maintained within the various surgical divisions. Residents also participate in weekly reading exercises using the SCORE curriculum, the leading online curriculum designed specifically for general surgery residents. SCORE grants residents access to a wealth of high-yield reference information.